Oil paint in stick form represents a revolutionary development in oil painting. It means that the paint can be applied directly to a surface without the distancing factor of the brush. This makes it possible to dispense not only with the brush, but with knives, palettes, and solvents, thereby making oil sticks more immediate and portable than standard oil painting materials. R&F uses only the basic traditional materials: natural wax (beeswax & plant wax), linseed oil, and pigment with absolute purity. The result is an oil stick with a lipstick soft consistency. 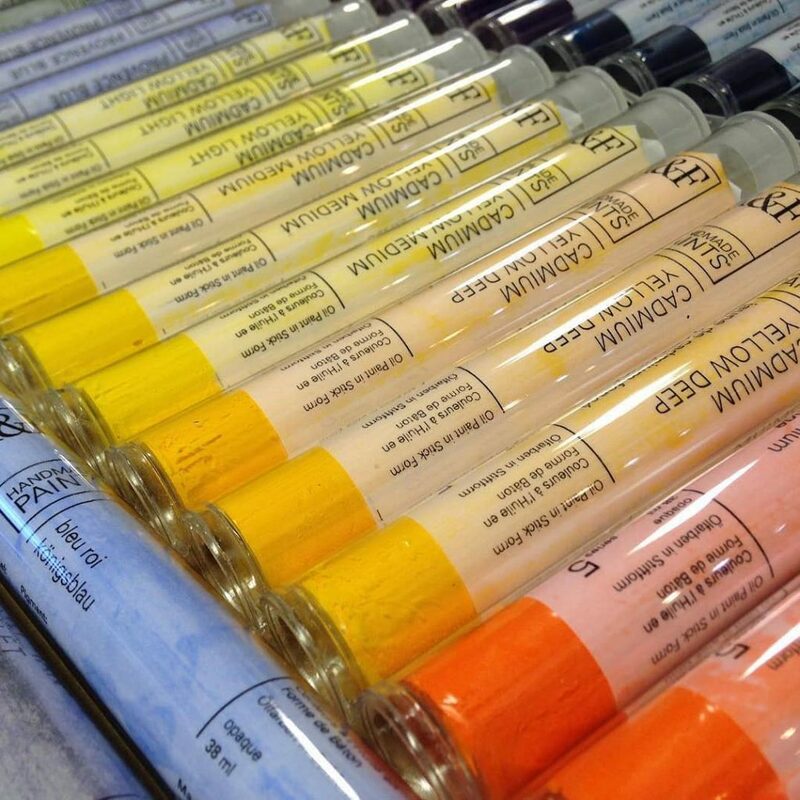 Used as Oil Paint: One way to use R&F Pigment Sticks is to treat them as if they were regular tube oils (almost like squeezing a tube right on the canvas) or use them in combination with tube oils. You can work on any surface just as you would with oils. Use brushes, solvents, and rags once the paint is on the surface. Many people dip the sticks in mediums or Alkyd driers and then attack the surface. Others will use them to start a painting with a quick sketch. Some will do their painting with tubes and brushes and then put in final details and lines with the sticks. 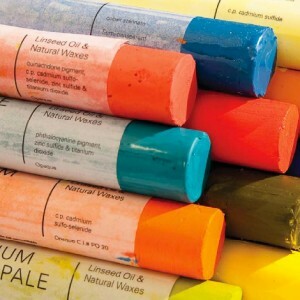 Used as a Drawing Tool: Pigment Sticks are becoming more prevalent as stand-alone painting and drawing tools. 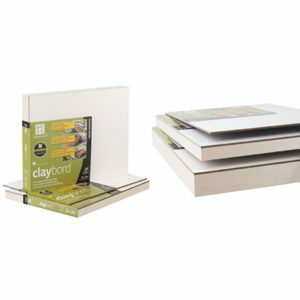 Many instructors use them in their drawing classes or in drawing marathons. They are a wonderful bridge between drawing and painting and their very nature causes artists to loosen up, use more color and be more spontaneous and gestural. Monotypes: Printmakers are falling in love with Pigment Sticks. Anyone who has spent hours trying to mix colors with only nine or ten printmaking inks will find our palette of 91 colors very liberating. Their immediacy, and mark making ability afford an endless range of options. They can be thinned with turpentine or mineral spirits. They can be worked with mediums by dipping them into stand oil, linseed oil, alkyd mediums, or resin gels. They can be mixed alongside tube oils or used to draw over dried oil paintings. Pigment Sticks can be manipulated with a paint knife until the paint is a buttery consistency, so that it can be brushed or knifed onto the surface. This method can be used to mix colors on the palette or in the painting. 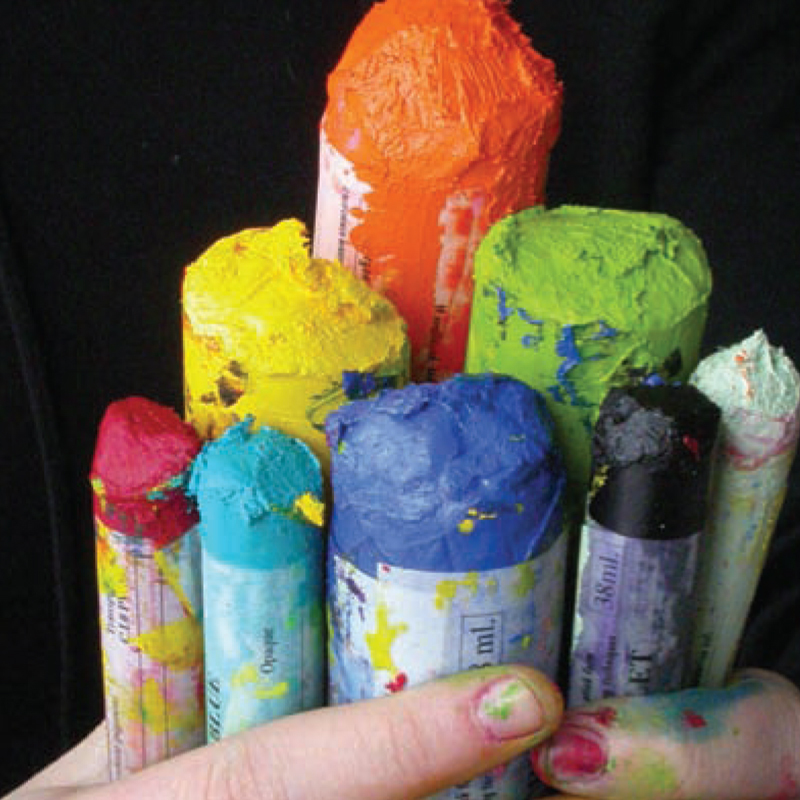 Supports: Pigment Sticks can be used on any ground suitable for use with traditional tube oil paint. Normally that means a sized canvas, panel, or paper. 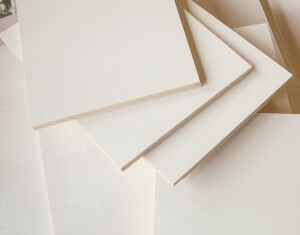 Gesso Boards, such as Belle Arti Gesso Panels or Ampersand Boards are ideal because of their dimensional stability. 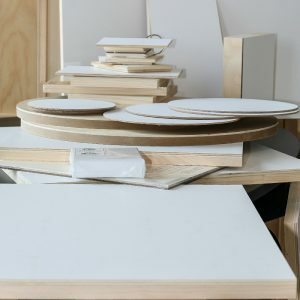 More absorbent surfaces like clay coated papers or encaustic boards will cause the paint to dry faster and leave a matte finish that is preferable to some painters. Sizing: As in oil painting, all canvas and paper surfaces should be sized. 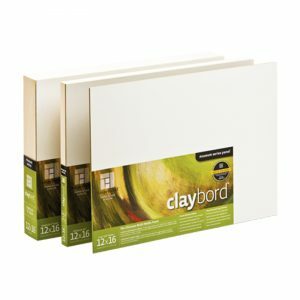 To size, use one or two coats of acrylic gesso, acrylic medium, or PVA sizing. Other options include: rabbit skin glue and shellac. 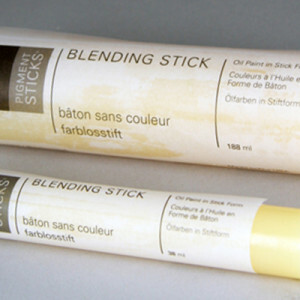 Grounds: Any ground (ie: gesso) suitable for traditional oil paint can be used with R&F Pigment Sticks. Varnishing: When thoroughly dry, Pigment Sticks can be varnished just as you would an oil painting.